The boats of City Barge include a ceremonial six oared shallop, several sliding seat gigs and most likely, the largest collection of Venetian boats outside Italy. 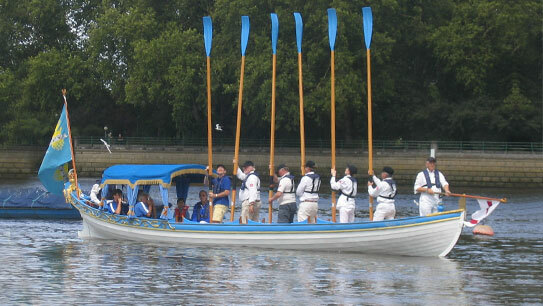 The club has access to a very elegant ceremonial boat called the “Royal Thamesis” which is a six oared shallop. She is a replica of Queen Mary’s barge of 1689. She needs a cox at the rear and a whiffler at the front to complete her crew. She is owned by the Drapers Guild in London, but stored near Oxford and operated by City Barge. Candidates for her crew are expected to have previous sitting rowing experience. Training outings to train the crew at working together occur annually. This boat goes to various prestigious events during the year, where she is much admired. There are seven club boats, six of which are normally kept in our Oxford boathouse. Six are Venetian models and one is a double, sliding-seat gig. The Venetians have developed about 30 models of boat. We have four sandolos, a mascareta and a gondolino. Club boats are available to row in, as a group, every Saturday morning, unless the river is flowing too fast. The boats are available to members to use at times to suit themselves, when they are sufficiently experienced. This was a gift from our good friends in Venice at the Querini Rowing Club in 1994. She is the boat in which most early members of the club learned to row Venetian style. The sandolo model is the “runabout” of Venice, ubiquitous, versatile and easy to handle. Giulietta is the greyhound of our five club boats, for two rowers, light to row, and light to transport. She was bought from Venice in 2000 and was donated to the club by Juliet Dunsmure. This model is the racing version of the gondola, at 160 kilos, and is used at the highest level of racing in Venice. Made at the Querini boat club, Venice and is typical of Venetian club boats. She was involved in a 300km trip from Venice to Trieste and back, achieved in record time. She was donated to the club by Sir John Sykes, one of our members. Regalo means the gift, in Italian, as this sandolo was a free gift from the Settemari Club in 2006. She is made almost entirely of mahogany, and so is heavy and stable. Tim Williams restored her from a sad and damaged state into the great boat she is today. This was made by Avon Boating in Stratford-upon-Avon in 2007 from plans bought from Venice. An ideal club boat, with four rowing places, she is popular with our members. She was commissioned from Nick Birch of Avon Boating by Richard Heffer, a City Barge member. This small mascareta was imported from Venice in March 2006. The boat is very light and was built in three days by Marco and Guido Vianello. The mascareta model is so named because it was often used by masked ladies of Venice. This is one of three very similar gigs previously owned by our founder Richard Norton. She was made by Banhams in Cambridge. She has two sliding seats, and a coxing seat, and is used each year on our “Downstream Row” from Lechlade to near Henley. The combination of the club boats and the member’s boats means that we have access to the largest collection of Venetian boats outside Italy. Members boats are privately owned and other members are invited to row them, at the owners discretion, at club events, and at private events, from time to time. One of the strengths of the club is the generosity of these owners.